For those of us who are a bit older than the average, there's a problem -- while our newer photographic memories are captured in digital format, the older photos were taken on film in the form of negatives that were usually printed or in slides. There are services that provide scanning of these images, but they're expensive, and many older methods of scanning slides were slow and of limited quality. That's all changed with the new KODAK SCANZA film scanner (US$169.99, Amazon affiliate link) from KODAK licensee C+A Global. The design of the SCANZA is perfect for sitting down and digitizing a pile of slides or negatives in one session. It's a small (5.1 x 4.7 x 4.5 inch / 12.95 x 11.94 x 11.43 cm) device with a bright 3.5-inch LCD color display on top, and various openings around the bottom to accommodate film/slide adapters. The adapters provide an easy way to feed in 35mm, 126, 110, Super 8 and 8m negatives and slides which can then be viewed on the screen to ensure proper alignment before capture. The images are captured with a 14-megapixel sensor, which is higher resolution than most smartphone cameras and even a lot of DSLRs. On the back of the unit are plugs for AC (a standard USB power cable and AC adapter are provided), an HDMI port if you wish to view the scanned images on a TV, and a film cleaning brush. There's also an SD card port, and here lies the brilliance of the SCANZA film scanner. Rather than relying on troublesome and often out-of-date scanning drivers, the SCANZA scans directly to SD card for easy transfer to Mac or iOS devices. Just for test purposes, I connected the SCANZA to my Mac using the USB Upload option, but although it showed that the scanner was connected to my Mac the computer never recognized it. It's just easier to scan to a card, then insert the SD card into the card slot (on an iMac and other compatible Macs) or a card reader. I've tried various film scanning methods in the past, and was usually frustrated right out of the box by Mac-incompatible drivers. Since the SCANZA saves everything directly to SD, I just set up the scanner on a table, grabbed a tray of 140 35mm color slides, and went to work. There's a power button on top of the unit that turns on the display, and there you're presented with a clean and simple-to-use user interface. The user interface has three primary buttons -- the power button, a "camera" button to capture a scan, and a Home button. Three buttons above that provide navigation as directed by the screen. Several of the UI screens can be viewed in the gallery below. Before I knew it, I had captured all 140 slides to the SD card. Before I started I had chosen to have the scanner capture at 22 megapixel resolution; that's actually done through interpolation and is not native to the 14 megapixel sensor. 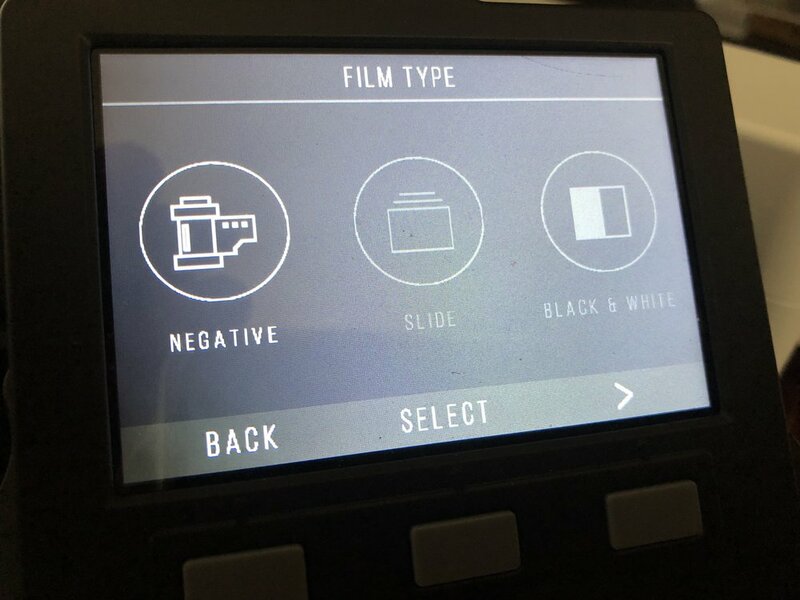 Other settings include the film type, the LCD brightness, film tray (which provides a built-in guide to which adapter is needed for what kind of film -- no more losing the user manual! ), memory (for the SD card), and language (English, French, Italian, German, Spanish). I did find it odd that there's no onboard setting for erasing and formatting the SD card, but that was easy to accomplish on the Mac anyway so it's not an issue. The onboard user interface also provides a Gallery -- a quick way to rotate or delete images, or show a quick slideshow of everything saved on the SD card. I found it easy and fast to find several duplicate scans I had accidentally made and delete them, as well as to grab portrait orientation scans and rotate them. Once I had my scans in order on the SD card, I shut down the scanner, pulled the SD card, and put it into the SD card slot of my iMac. The images were easy to import into Photos immediately, and I used the Photos editing tools to crop out any slide border remaining, straighten a tilted horizon, and even clean off dust spots. One suggestion -- it's a good idea to use the provided film cleaning brush on old negatives and slides. As you can see from the gallery above (highlighting photos of a cruise my wife and I took back in 1984! ), the scans look pretty darned good. Any problems with the images are probably more related to the limitations of the Pentax film cameras I used back in the day than to the scanner (the vignetting you see on some of the photos, for example). Feel free to laugh at my 1984 self, complete with hair -- I did -- and the "huge" cruise ships from that era that could fit into the swimming pools of today's behemoths. I used to send my slides and film to a slide scanning company and paid anywhere from $0.35 to $0.50 per slide for the privilege. Considering the quality of the results I got from the SCANZA film scanner, and that I can simply scan at my leisure, I'm going to be scanning my own old photos now. The KODAK SCANZA is a solid, well-designed, and well-implemented product.